WWD – Three years after launching his diffusion line Derek Lam 10 Crosby, Lam today has opened the contemporary collection’s first stand-alone store in New York. 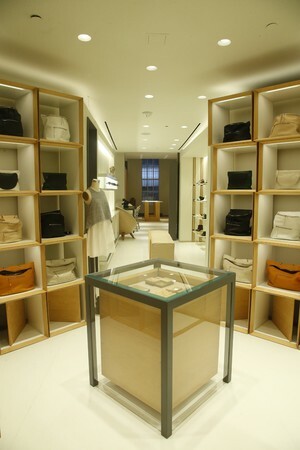 Named for the company’s former headquarters on Crosby Street, the store is located a few blocks away at 115 Mercer Street in SoHo amid a row of other hot contemporary labels, such as 3.1 Phillip Lim, A.P.C., Rag & Bone and Carven. Further north on the street are Marni, Marc Jacobs and Balenciaga. “The adjacencies are very much part of this,” said Lam of the location. “It’s an important street in SoHo. I used to live right on Mercer, so when I got our new puppy, I was constantly walking up and down and I realized it’s where the locals were shopping.” The 2,200-square-foot space is designed by William Sofield of Studio Sofield. Lam said he wanted to avoid the “long, bowling-alley formations” often found in SoHo. “I told Bill I wanted this concept of discovering,” said Lam. “He created a lot of nooks and corners to highlight handbags and jewelry, and so people really feel like they’re not in this big, vast space.” Shelving is inspired by packing crates, with the clothes displayed as if they’ve just arrived and are being unpacked. There are work tables to highlight various groups of merchandise, including jewelry from Jennifer Meyer. Featuring exclusive collections from other labels is part of the plan for the store.